After watching this video on youtube http://www.youtube.com/watch?v=NkoSY50FUBM I decided to make my first ravioli. Since I don’t own a pasta machine, it took a lot of elbow grease but it was well worth it! Enough for two. Note: Soon after eating the ravioli I stopped being able to taste anything, that is everything taste metallic and bitter. I was a bit worried about this and researched the internet ignoring the serious illnesses (I am the eternal optimist) and came across several articles identifying pinenuts (from China?) as possible culprits for this problem. Check out http://journals.lww.com/euro-emergencymed/pages/articleviewer.aspx?year=2001&issue=03000&article=00036&type=fulltext for more information. In future (0r until I can try out Italian pinenuts to see if the same problem arises) I am going to use walnuts in the following ravioli filling. Weigh the ingredients into the Thermomix or food processor and process on REVERSE, speed 5 until the mixture looks like coarse couscous. Add water 1 tsp at a time and then remove the dough from the machine. Knead to form a ball of dough and leave in the fridge for at least 30 minutes. Mix the ingredients in the Thermomix until they are coarsely chopped. Don’t purée the ravioli filling, it’s nice if the nuts are only roughly chopped. Taste and season with more salt and/or pepper if necessary. Fry the red onions in butter until they are translucent. Add the cream and the parmesan and stir constantly while the sauce reduces to a thicker consistency. 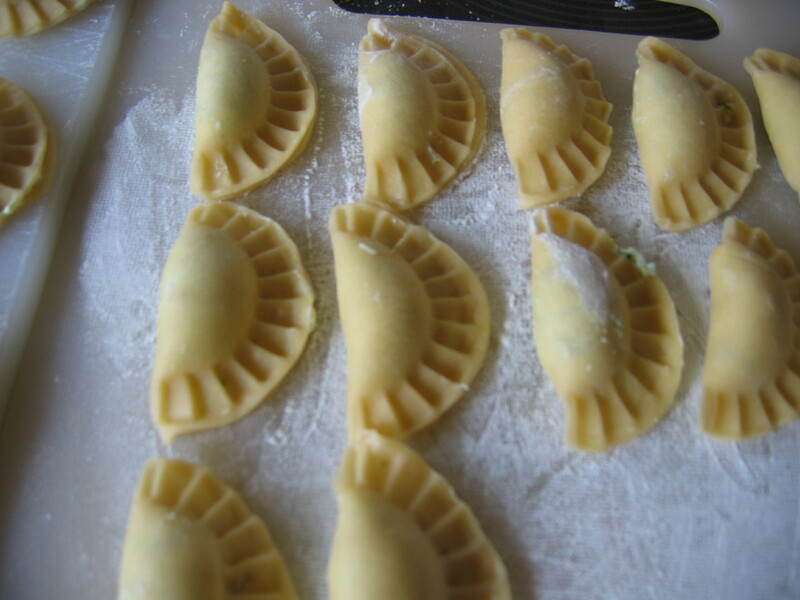 Just before serving with the ravioli, add the lemon juice and salt and pepper to taste. Add the roughly chopped spinach and stir through a few times to wilt the spinach. Drain the ravioli and mix with the sauce carefully before serving. 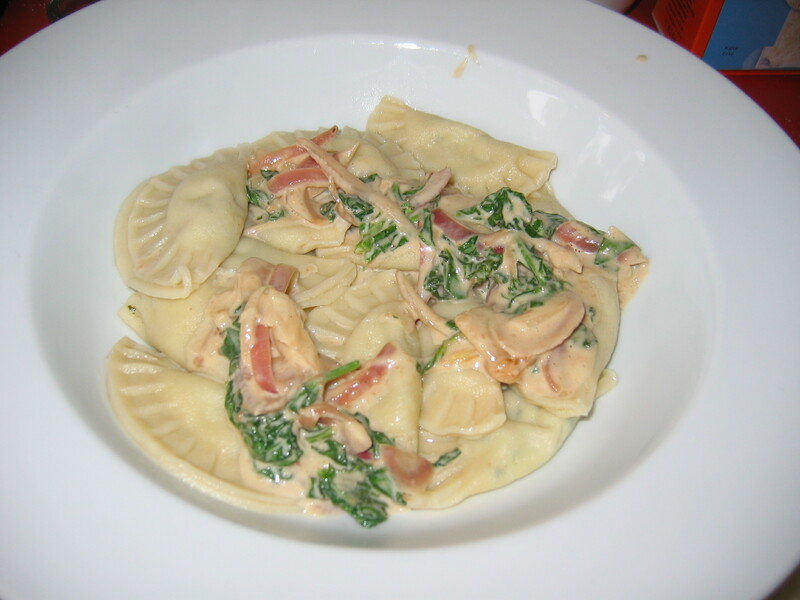 Surprisingly enough, it was really easy to make the ravioli although very time consuming. My next project is strudel since my husband is Hungarian. Here’s a wonderful video of a Hungarian woman showing the world how to stretch strudel dough to the size of a table: http://www.youtube.com/watch?v=99Xe727MZvY . Absolutely amazing!